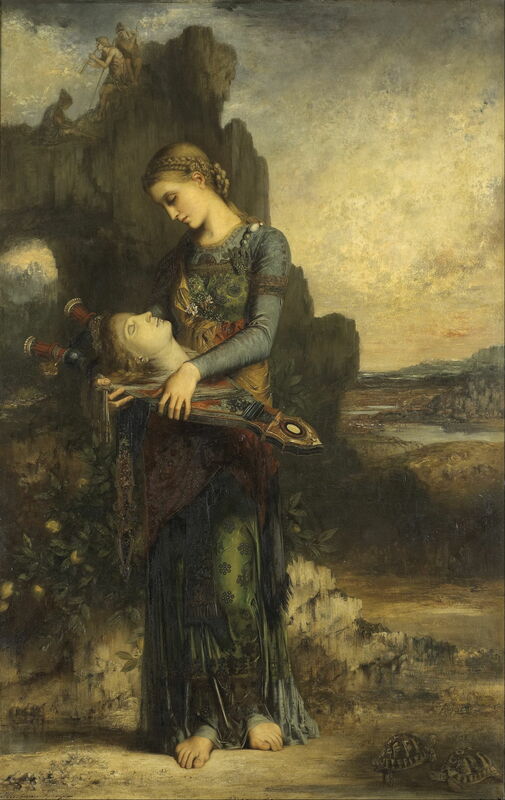 Gustave Moreau (1826–1898), Orpheus (1865), oil on panel, 154 × 99.5 cm, Musée d’Orsay, Paris. Wikimedia Commons. The only explanation that I can find is that “they may be read as symbols of immortality (but also of silence)” (Cooke, p 62), which left me more puzzled than before. This article is a short pictorial journey to discover a little more about the significance of tortoises in paintings. Shibata Zeshin (1807–1891), Jurōjin, Deer and Tortoises in a Landscape (1889), ink and colour on silk, Honolulu Museum of Art, Honolulu, Hawaii. Wikimedia Commons. Outside Europe, and particularly in east Asia, tortoises have a long and glorious history of depiction in art. One relatively recent example is Shibata Zeshin’s Jurōjin, Deer and Tortoises in a Landscape (1889), where three tortoises seem to have swept up at speed towards the wizened figure of Jurōjin; compared with the static deer, they are part of an enigmatic reversal of reality. 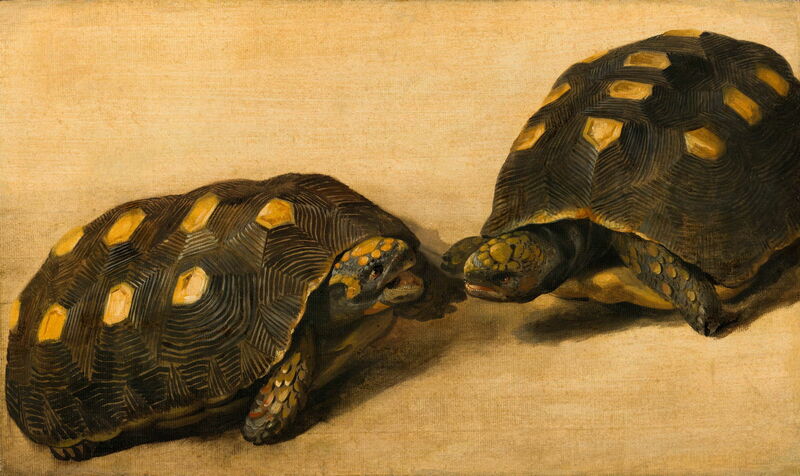 Albert Eckhout (c 1610–1666), Study of Two Brazilian Tortoises (c 1640), tempera and gouache on paper mounted on panel, 30.5 x 51 cm, Koninklijk Kabinet van Schilderijen Mauritshuis, The Hague, The Netherlands. Wikimedia Commons. In European painting, they have inevitably appeared in portraits as new faunas have been discovered, as in Albert Eckhout’s Study of Two Brazilian Tortoises (c 1640). Edward Lear, the British writer and watercolour painter, produced beautiful illustrations of various species for reference books. 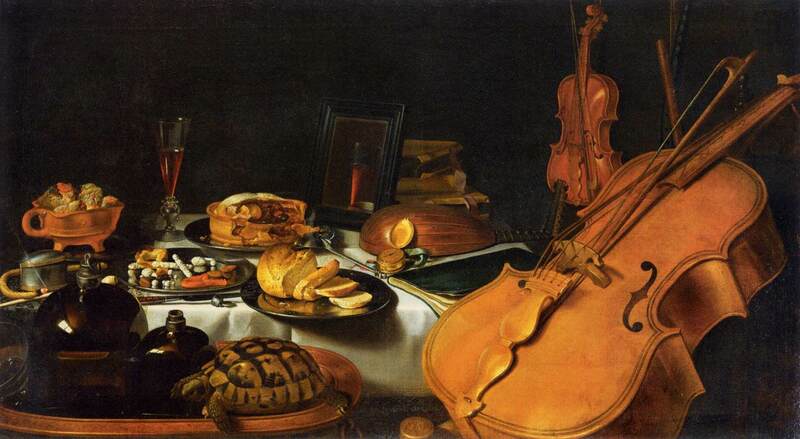 Pieter Claesz (1597/1598-1660), Still Life with Musical Instruments (1623), oil on canvas, 69 x 122 cm, Musée du Louvre, Paris. Wikimedia Commons. They appear occasionally in still life paintings too, where they are probably one of the most appropriate animals for the genre. Pieter Claesz’s Still Life with Musical Instruments (1623) seems an ideal setting, matching the shape of the body of a lute, and the colour of wood. 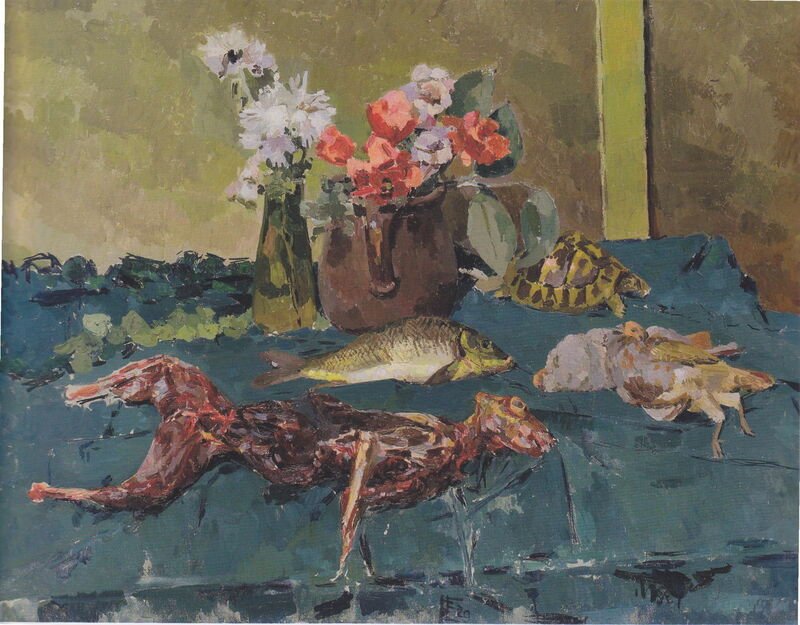 Felix Esterl (1894–1931), Still life with Skinned Hare, Chicken, Fish and Turtle (1929), oil on canvas, 82 x 110 cm, Leopold Museum (Die Sammlung Leopold), Vienna, Austria. Wikimedia Commons. Felix Esterl’s Still life with Skinned Hare, Chicken, Fish and Turtle (1929) provides more worrying company for a tortoise or turtle, though. 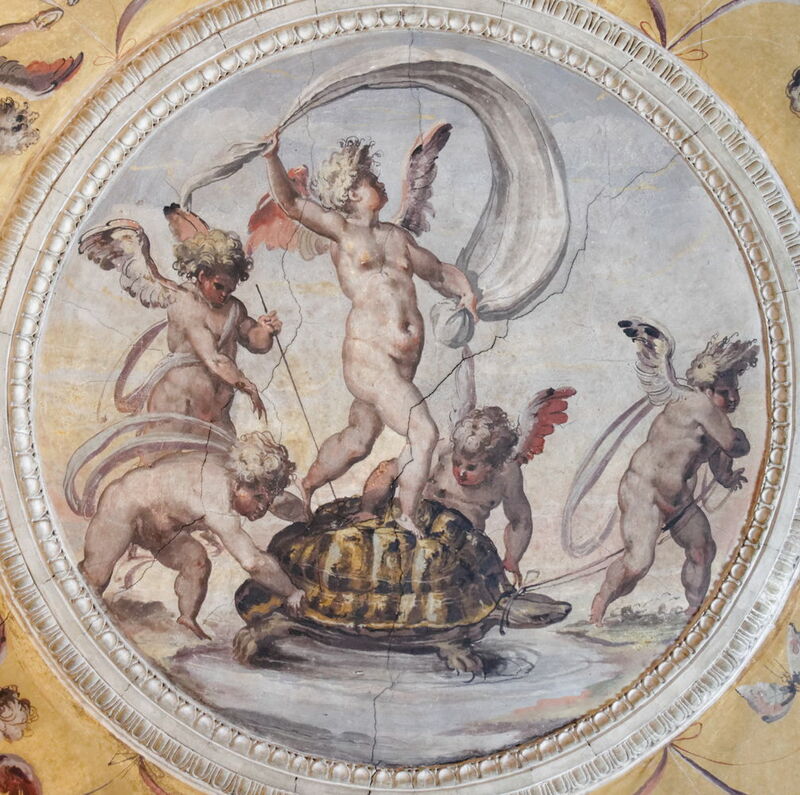 Marco Marchetti (c 1526-1588), Putti with a Tortoise (1556-58), fresco, dimensions not known, Palazzo Vecchio, Florence. Wikimedia Commons. In ancient times, tortoises have had a more fundamental role in the cosmos, almost as much as in Terry Pratchett’s Discworld, where Great A’Tuin is a vast turtle who bears four huge elephants, who in turn bear Discworld itself. Marco Marchetti’s Putti with a Tortoise (1556-58) is far more modest in scale. Artist not known (Prague School), Elegant Lovers (c 1550), oil on wood, 38.1 x 26.7 cm, Private collection. Wikimedia Commons. The Romans and Greeks of Classical times associated the tortoise with love, and reproductive fertility, and made the animal an attribute of Aphrodite. That may explain the goal of Marchetti’s putti, and the diminutive tortoise crawling across the lap of these Elegant Lovers (c 1550). 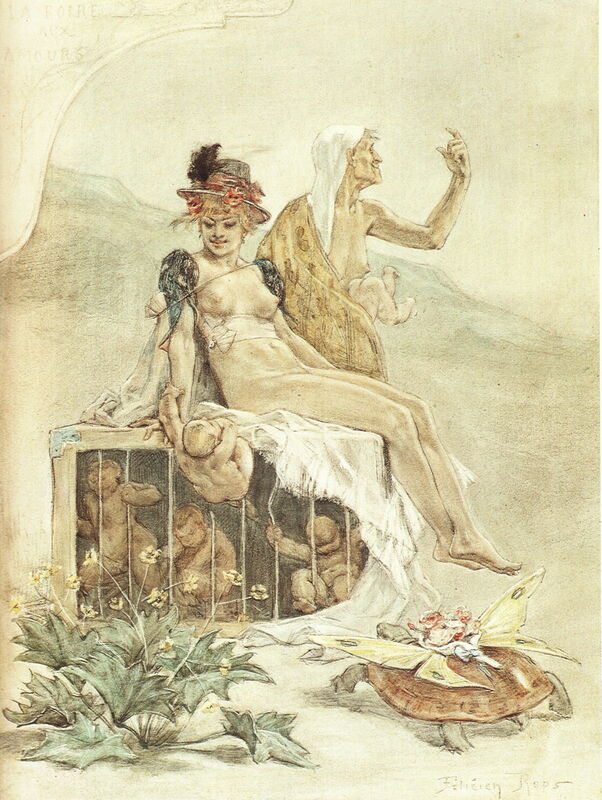 Félicien Rops (1833–1898), La foire aux amours (The Love Fair) (The Cage) (1878-1881), pencil and watercolour on paper, 27 × 20.5 cm (10.6 × 8.1 in), Musée provincial Félicien Rops, Namur, Belgium. Wikimedia Commons. It might also provide a reason for Félicien Rops including a prominent tortoise with butterfly wings in his ribald The Love Fair (The Cage) (1878-81). However, Rops is, as ever, determined not to provide us with a simple reading. There are two famous classical stories involving tortoises which might be relevant. 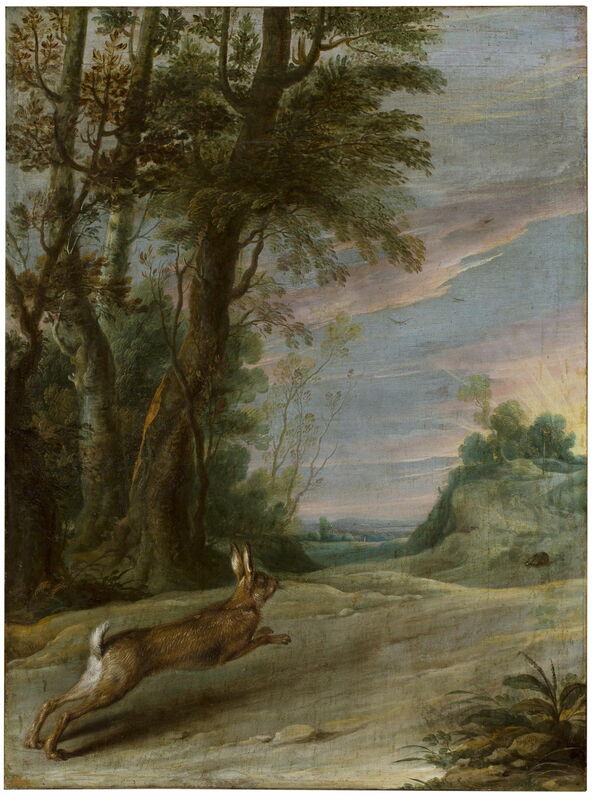 The first is Æsop’s fable of the Tortoise and the Hare, who race against one another. Although the hare is much faster, the tortoise is more persistent, and eventually wins. This is one of relatively few paintings (as opposed to illustrations) showing this race, by Frans Snyders: The Fable of the Hare and the Tortoise (1600-57). There is also a group of tales concerning tortoises being dropped by birds, including the claim that the playwright Æschylus was killed by a tortoise which had been dropped by an eagle – which I have been unable to locate in a history painting. In the early 1880s, Moreau painted an illustration to one of la Fontaine’s fables involving a tortoise and two ducks. In this, the tortoise is taken into the air while holding a stick in its mouth, until it speaks in self-admiration; it then falls to the ground and its shell is smashed. Vincenzo Carducci (1578–1638), The Vision of Dionisio Rickel, the Carthusian (1626-32), oil on canvas, 336.5 × 297.5 cm, Museo Nacional del Prado, Madrid. Wikimedia Commons. Tortoises also appear sporadically in situations where their presence seems almost gratuitous. In Vincenzo Carducci’s The Vision of Dionisio Rickel, the Carthusian (1626-32), a black cat is playing with a tortoise, and hinting strongly at allegory. If the cat represents the devil, the hard-shelled tortoise might indicate invulnerability to the wiles of the devil, perhaps. 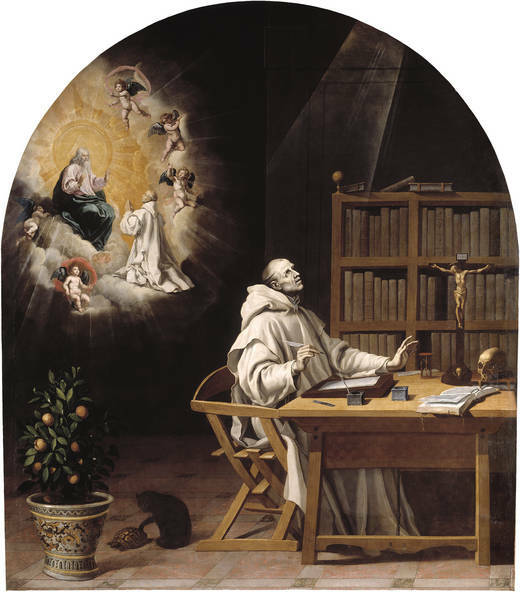 Dionisio Cartujano (1402-1471), or Denys van Leeuwen, or Denis de Rickel, or Denis the Carthusian, was a pious and ascetic Carthusian monk who wrote more than 150 works, including a complete Bible commentary. He was responsible for building a monastery in ‘s-Hertogenbosch when Hieronymus Bosch was a young man there. 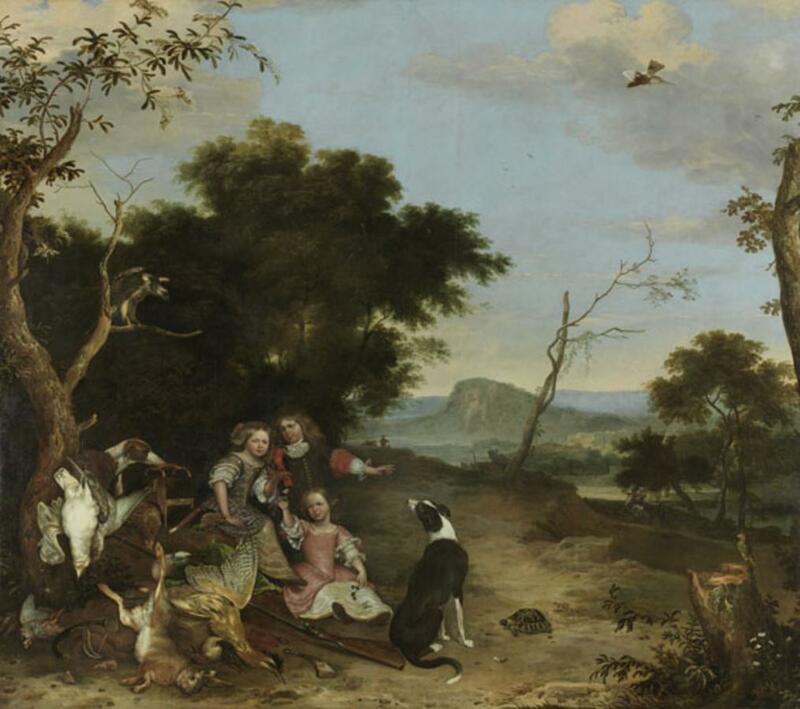 Melchior d’Hondecoeter (1636–1695), Portrait of Three Children in a Landscape with Game (date not known), oil, 1300 × 400 cm, Alte Pinakothek, Munich. Wikimedia Commons. Melchior d’Hondecoeter (1636–1695) painted his vast Portrait of Three Children in a Landscape with Game in the latter half of the 1600s. The children appear to have taken to field sports at a very early age, and have here amassed an impressive ‘kill’, with their muzzle-loading gun – although I suspect (and hope) that an unseen adult may have had a hand in its use. The lone tortoise, which is being ignored by each of the children and dogs, is slowly crawling its way towards them, as if it has just emerged into the wrong painting. Perhaps d’Hondecoeter just liked tortoises. John William Godward (1861–1922), The Quiet Pet (1906), oil on canvas, 50.8 x 76.2 cm, Private collection. Wikimedia Commons. 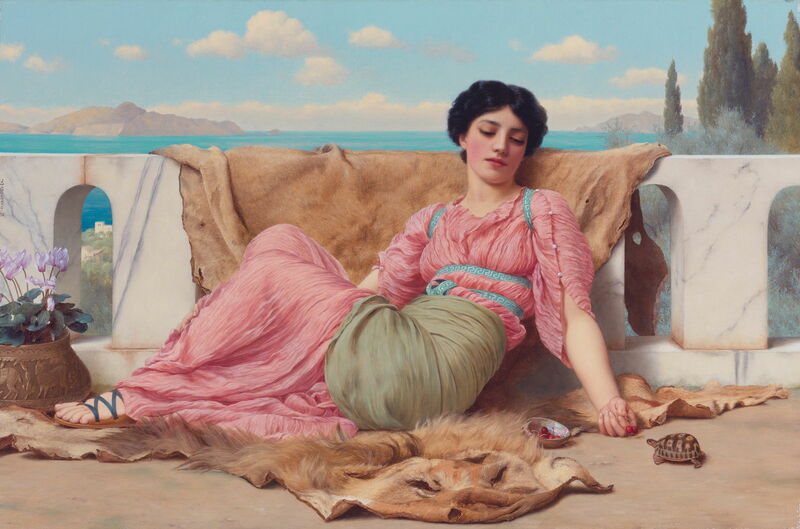 John William Godward used the tortoise in one of his aesthetic paintings, The Quiet Pet (1906). One of his languidly beautiful women is seen in repose, offering a couple of cherries to her small pet tortoise, as a means of passing the time. I am unsure whether we should try to read anything more into the painting, but it begs the question as to whether the artist saw the tortoise or the woman as the ‘quiet pet’, and whether the offer of cherries should be interpreted any further. My final painting is by far the most important, with the exception of Moreau’s Orpheus, and was an exciting discovery on this journey: it is Osman Hamdi Bey’s magnificent The Tortoise Trainer (1906). Trained in Paris during the 1860s by Jean-Léon Gérôme and Gustave Boulanger, I am sure that they would have been proud of his technique, style, and the work as a whole. Its ingenious allegory can be read in at least two ways. 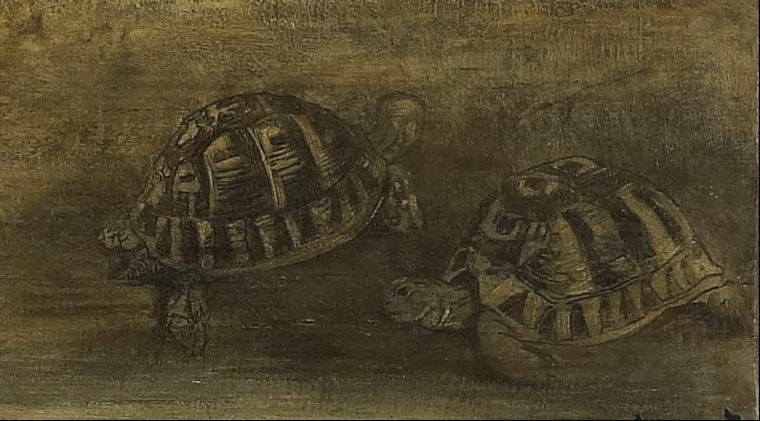 The artist may have been self-critical of his painstakingly slow work; tortoises are not only inherently slow, but in the early eighteenth century had been used to bear lit candles for evening outings. However, it also had a greater political meaning, as the tortoise trainer wears traditional Ottoman religious costume from before the middle of the nineteenth century, and is training the tortoises with a traditional ‘ney’ flute. In that sense, it is a satire on the slow, faltering, and often ineffective reforms made to the Ottoman Empire during the late nineteenth century. This led a time of increasing social and political upheaval, preceding the Young Turk Revolution of 1908 which changed the basis of rule in the empire, then after the First World War the empire’s breakup. In 2004, this painting set a new Turkish record, when it was sold for $3.5 million. 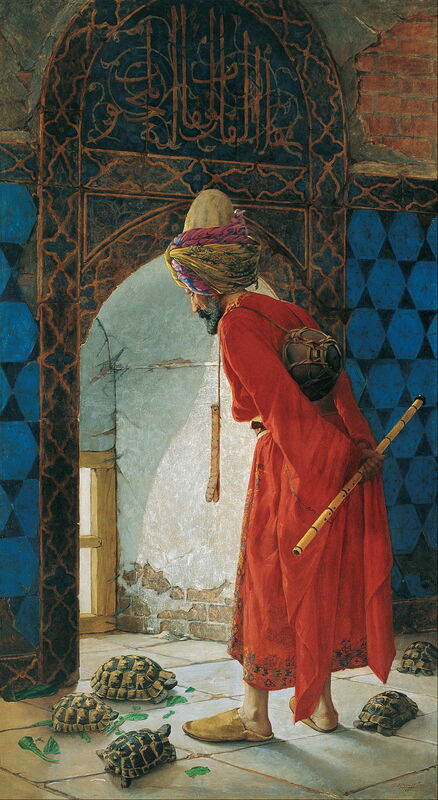 It has been proposed that Osman Hamdi Bey may have been inspired by this print created by “L. 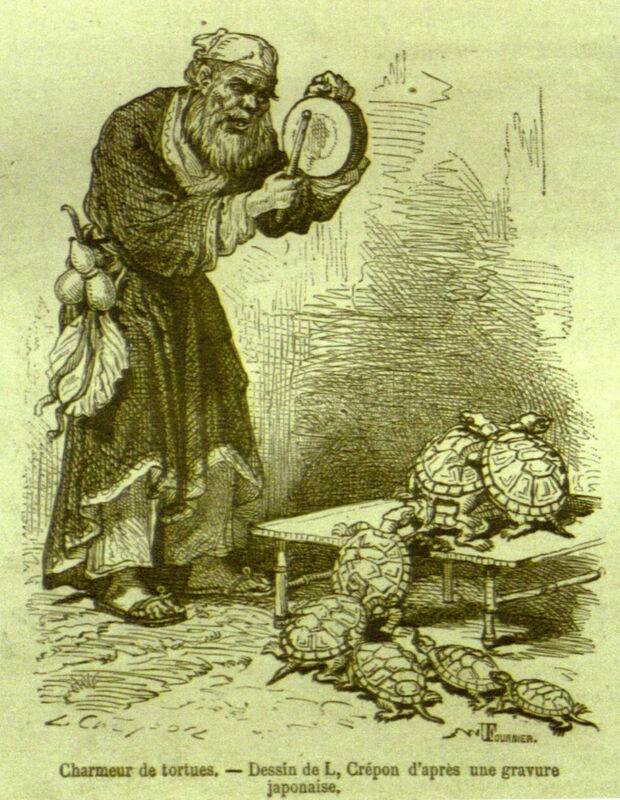 Crépon”, of the Tortoise Charmer of 1869. Gustave Moreau (1826–1898), Orpheus (detail) (1865), oil on panel, 154 × 99.5 cm, Musée d’Orsay, Paris. Wikimedia Commons. Having spent a day studying paintings of tortoises and struggling to make sense of it all, I went back and looked at Moreau’s Orpheus. It then struck me that the tortoise shells are not only not identical, but appear to have been deliberately fashioned to accommodate initials: perhaps a g then a large and clear M on the left, and A D on the right. Gustave Moreau had met his partner/mistress/muse Alexandrine Dureux in about 1860. By the time that he painted Orpheus, he had accommodated her in a nearby flat. If he saw himself, perhaps in the role of Orpheus, torn apart by Maenad art critics because he refused to worship their gods, maybe Alexandrine was his Thracian woman. And the two tortoises of Aphrodite were him carving their initials on an old tree: GM ❤️ AD. Posted in General, Painting and tagged Bey, Carducci, Claesz, d'Hondecoeter, Dureux, Eckhout, Esterl, Godward, Lear, Marchetti, Moreau, painting, Rops, symbol, symbolism, tortoise, turtle, Zeshin. Bookmark the permalink. I college they focused the image of them more towards fertility, however I feel that this piece provides far better explanations as to why they’ve been used far and wide and within different genres. Nice work! Thank you. Few symbols seem to have just a single association, but I was surprised at just how widely tortoises have been used. I did a paper on Moreau in university, I can barely remember anything now. Thank you. It is a true delight: I had long put off really trying to read his paintings and understand his career. I think that I’m finally getting the hang of them. I must find time to go back to Paris and visit his museum too.